Mexico, the second most populous country in Latin America, has a population of more than 120 million, and 78% live in urban areas. The United States’ second-largest agricultural trading partner and third-largest trading partner overall, Mexico is now considered a middle-income country with the world’s 15th-largest economy. Mexico has a rich history and proud culture that reflect its pre-Columbian civilizations and Hispanic heritage. With one-fifth the area of the United States (about 3 times the size of Texas), Mexico has diverse geographic features within its 32 states. The Sonoran desert is in the northwest, beautiful beaches are available on both coasts, and forested mountain ranges traverse the western and eastern mainland. Impressive volcanic peaks rise up to 18,000 feet above the high central plateau. The Yucatán Peninsula and southern regions are tropical. The Copper Canyon in the northwestern state of Chihuahua is larger than the US Grand Canyon. (See Map 4-09). Mexico City is one of the world’s largest cities, with a population of more than 20 million. Despite increasing national prosperity, Mexico’s large cities contain much poverty. Extensive migration has taken place from the poor rural south to the northern border for jobs in bustling border cities, such as Ciudad Juárez and Tijuana. Mexico has the most foreign visitors of any Latin American country and is the country most frequently visited by US tourists. Travel to beach resorts such as Acapulco, Ixtapa, Cancún, Puerto Peñasco, Cozumel, Puerto Vallarta, Nuevo Vallarta, and Cabo San Lucas, along with cruise ship tours, makes up a large portion of tourism to Mexico. Also common are day trips to northern border cities and longer cultural trips to historical and World Heritage sites. Popular pre-Columbian anthropologic destinations include Teotihuacan outside Mexico City, Great Pyramid of Cholula in Puebla, Tulum and Cobá in Quintana Roo, El Tajín in Veracruz, Chichen Itzá in Yucatán, Monte Alban in Oaxaca, and Palenque in Chiapas. Baja California offers whale watching on the Pacific Coast and sports fishing in the Gulf of California. A large number of US residents travel to Mexico to receive health services (medical tourism). Only Thailand sees a higher number of US travelers for this purpose. The main services sought are dental services, eye care, and cosmetic surgery in the border cities. Increasingly, a complete range of services and specialized procedures are offered in cities with large medical services infrastructure, such as Mexico City, Monterrey, Mérida, Cancún, and Guadalajara (see Chapter 2, Medical Tourism). All travelers should be up-to-date with their routine immunizations. Hepatitis A is endemic in Mexico, and all travelers should be immunized with at least the first dose of hepatitis A vaccine before travel to Mexico. Hepatitis B vaccine should be considered for all travelers and is recommended especially for those with expected long-term stays (≥6 months), those who plan to use medical services, or who might be exposed to blood or other body fluids (including through sexual contact). Other vaccines, such as typhoid and rabies, may be considered, especially for those visitors (such as field biologists, nature adventure tourists) who will be traveling to less developed, remote areas of the country. Travelers should be educated on how to avoid animal bites to reduce the risk of rabies. In Mexico, the most common animal species that carry rabies are unvaccinated dogs or cats and wild animals such as bats, coatis, coyotes, foxes, and skunks. Preexposure rabies vaccination should be considered for travelers who are likely to come into contact with these animals or those who will be traveling to areas with limited access to medical care. Travelers’ diarrhea is common among visitors to Mexico. In addition to practicing food and water precautions, travelers should consider bringing an antibiotic for self-treatment of diarrhea (see the Food & Water Precautions and Travelers’ Diarrhea sections in Chapter 2). Travelers should keep in mind that tap water is not potable and should avoid consuming raw dairy products, undercooked meat or fish, leafy greens, or raw vegetables. Foodborne infections that are a risk in Mexico include amebiasis, cysticercosis, brucellosis, listeriosis, and infections with Mycobacterium bovis. Cholera is considered a low risk in Mexico; however, travelers should adhere to food and water precautions. Dengue is endemic throughout Mexico, and large outbreaks of dengue have been reported. Dengue virus transmission should be considered a risk year-round. Chikungunya was first reported in Mexico in 2014, and Zika was first reported in 2015. Travelers should take steps to prevent mosquito bites by using insect repellent, wearing long-sleeved shirts and long pants, and staying in accommodations that are well screened or air conditioned (see Chapter 2, Protection against Mosquitoes, Ticks, & Other Arthropods). Because of the risks to pregnancy, travelers should consult the CDC Travelers’ Health website (www.cdc.gov/travel) for the most current recommendations for Zika. Malaria incidence has decreased dramatically in recent decades in Mexico, and risk of infection with Plasmodium vivax among US travelers is considered very low. Major resorts are free of malaria, as is the US–Mexico border region. Malaria prophylaxis is recommended for travelers to Campeche, Chiapas, Chihuahua, Nayarit, and Sinaloa. Mosquito avoidance but not chemoprophylaxis is recommended for travelers to Durango, Jalisco, Oaxaca, Sonora, Tabasco, and Othón P. Blanco municipality of Quintana Roo. 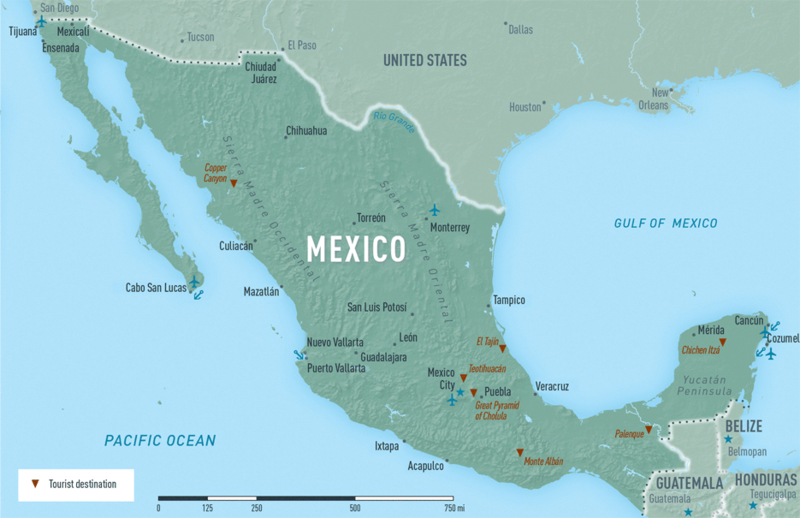 Rickettsial diseases found in Mexico include Rocky Mountain spotted fever, which is potentially fatal unless treated promptly with antibiotics, and fleaborne typhus, which usually causes symptoms that are similar to dengue. Travelers should take precautions to avoid flea and tick bites both indoors and outside. Rocky Mountain spotted fever associated with Rhipicephalus sanguineus, the brown dog tick, has been identified recently in northern Mexico in urban and rural areas with large stray dog populations. Cutaneous leishmaniasis, transmitted by sand flies, is found in focal areas of coastal and southern Mexico. The risk is higher for ecotourists, field biologists, and long-term travelers. Travelers should prevent fly bites, which includes avoiding outdoor activities at night. Travelers to beach areas may be at risk for cutaneous larva migrans (CLM), a creeping skin eruption most commonly associated with dog hookworm infection. CLM can be prevented by wearing shoes and avoiding direct skin contact with sand. Chagas disease is endemic throughout Mexico. Influenza virus strains similar to those in the United States circulate in Mexico, as was demonstrated by the emergence of pandemic influenza A (H1N1) in North America in the spring of 2009. Coccidioidomycosis, a fungal respiratory disease caused by inhaling spores in the soil, is endemic in northwestern Mexico. Several outbreaks of coccidioidomycosis have been reported among missionary groups from the United States doing construction projects in this region. Histoplasmosis, another fungal respiratory disease agent found in soil, is endemic in other regions of Mexico, mainly the central and southeast regions. Although cases of legionellosis are reported worldwide, CDC has investigated travel-associated clusters of legionellosis in association with hotels and resorts in Mexico. Legionellosis should be considered in elderly and immunocompromised travelers who develop pneumonia within 14 days of travel. Mexico’s TB incidence is lower than rates in Asia, Africa, and Eastern Europe, but is 5 times that of the United States. The potential risk of exposure and infection with M. tuberculosis should be discussed with travelers planning long-term stays (≥6 months) or those who may be exposed to patients with untreated TB (such as those working in health care settings, homeless shelters, or prisons). Good health care is available in most Mexican cities, and hotels in tourist resorts usually have well-trained physicians available. Travelers should be aware that payment up front (cash or credit card) may be required before receiving any care. Also, most providers do not accept US domestic health insurance or Medicare/Medicaid plans. Injuries, rather than infectious diseases, pose the largest risk of death among healthy travelers to Mexico. In one review, the leading cause of death to all US travelers to Mexico was injuries (51%), and 18% of deaths resulted from motor vehicle crashes. Mexico’s highway system and roads have become increasingly modernized over the years. Toll highways are often of high quality. Nevertheless, driving in traffic in cities and at night through the countryside can be dangerous. Travelers should fasten seat belts when riding in cars and wear a helmet when riding bicycles or motorbikes. Although travel in Mexico is generally safe, drug-related violence has continued to increase in parts of the country. Department of State advisories should be monitored for relevant safety and security alerts. Air pollution in Mexico City, while decreased in recent years, can be particularly severe during the dry winter months and can exacerbate asthma and chronic lung and heart conditions. Both healthy travelers from lower elevations and people with lung and heart conditions should cautiously acclimate to Mexico City’s altitude. Most injuries and deaths caused by poisonous Centruroides genus scorpions are reported from states in the Pacific Coast (from Sonora to Oaxaca) and in the center states of Morelos, State of Mexico, Guanajuato, and Durango. Travelers should exercise caution when visiting Mexico’s rural areas and when participating in outdoor activities, especially during spring and summer. Brathwaite DO, San Martin JL, Montoya RH, del Diego J, Zambrano B, Dayan GH. The history of dengue outbreaks in the Americas. Am J Trop Med Hyg. 2012 Oct;87(4):584–93. CDC. Update: novel influenza A (H1N1) virus infection – Mexico, March–May, 2009. MMWR Morb Mortal Wkly Rep. 2009 Jun 5;58(21):585–9. CDC. Human rabies from exposure to a vampire bat in Mexico—Louisiana, 2010. MMWR Morb Mortal Wkly Rep. 2011 Aug 12;60(31):1050–2. CDC. Notes from the field: outbreak of Vibrio cholerae Serogroup O1, Serotype Ogawa, Biotype El Tor Strain – La Huasteca Region, Mexico, 2013. MMWR Morb Mortal Wkly Rep. 2013;63(25):552–3. Fitchett JR, Vallecillo AJ, Espitia C. Tuberculosis transmission across the United States–Mexico border. Rev Panam Salud Publica. 2011 Jan;29(1):57–60. Flores-Figueroa J, Okhuysen PC, von Sonnenburg F, DuPont HL, Libman MD, Keystone JS, et al. Patterns of illness in travelers visiting Mexico and Central America: the GeoSentinel experience. Clin Infect Dis. 2011 Sep;53(6):523–31. Laniado-Laborin R. Coccidioidomycosis and other endemic mycoses in Mexico. Rev Iberoam Micol. 2007 Dec 31;24(4):249–58. Leparc-Goffart I, Nougairede A, Cassadou S, Prat C, de Lamballerie X. Chikungunya in the Americas. Lancet. 2014 Feb 8;383(9916):514. Spradling PR, Xing J, Phippard A, Fonseca-Ford M, Montiel S, Guzman NL, et al. Acute viral hepatitis in the United States-Mexico border region: data from the Border Infectious Disease Surveillance (BIDS) Project, 2000–2009. J Immigr Minor Health. 2013 Apr;15(2):390–7.